This is not the best photo of my work but you get the idea. Area residents will recognize this - well, if you try hiking or biking Sandlake Road instead of drive too fast. I felt it was time for a re-do of this watercolor due to receiving some recognition. This small watercolor has a bit more value range than is indicated from the photograph: My digital camera has been giving me a bit of trouble, lately - I may have to save up for another one. 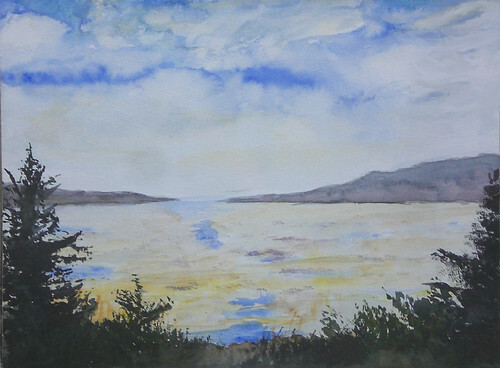 I'm reading: Sandlake Estuary (Watercolor)Tweet this!